It took longer than necessary, only because I decided to oven cook the chicken so I didn't have to stand over it. Instead, I played with the kids for 15 minutes. I threw 2 plain chicken breasts in the oven, no dressing, and cooked for about 35 - 40 minutes. While the chicken was baking (and after play time) I put some wholewheat pasta on to boil (I'm cooking for 2 btw, so all portions are relative). When cooked, I drained the pasta and here's the secret ingredient: supermarkets sell pots of feta cheese in herb oil. I love these pots. They make brilliantly easy delicious salads. Some have olives, some have garlic, some have both. This one as it happens had neither of these extra ingredients, just Feta, oil and herbs. 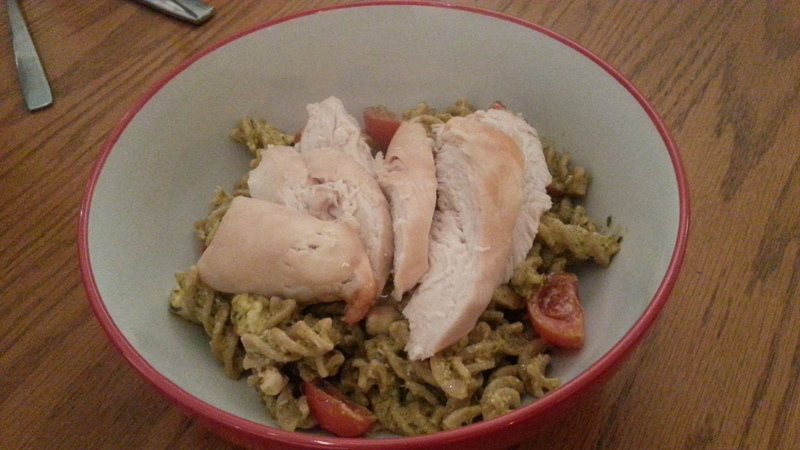 I mixed this with the pasta, added a spoon of green pesto and some halves of cherry tomatoes. I sliced the chicken and placed on top and served with garlic bread and a pot of Parmesan. If the chicken had've been ready to eat, the whole dish would take 10 mins tops.